From left, Claire Clifford, Scott Martin and Lindesay Patterson at the Barratt Developments North East commemorative tree-planting ceremony at the company's South Fields development in Morpeth. Barratt Developments North East celebrated a major anniversary with a commemorative tree-planting event at its South Fields development in Morpeth. Managing director Scott Martin planted the rowan tree on the official anniversary date of the housebuilder to mark the past 60 years of Barratt Homes and to celebrate the future of the company. Its story begins in the 1950s with Lawrie Barratt, a young accountant on a modest income who could not afford to buy the house he wanted for his family, so he set out to build one for himself instead. Leaving school at 14, with no qualifications, he worked hard to save £1,000 and at the age of 25 bought five acres of land at Darras Hall, Ponteland. With little knowledge of the building industry, but unbounded enthusiasm, Lawrie built his very own four-bedroom detached house and found the project to be satisfying, creative and also profitable, with the house being valued at £3,000 when complete. With money earned from the sale of the first house, he built two more houses nearby to sell, ultimately leading to the formation of Barratt Developments in 1958. As it grew to cover different parts of the country, Lawrie’s goal was to make the house-buying process as affordable and easy as possible for those looking to get on the property ladder, which is a value still held strongly by the housebuilder today. The company built more than 17,300 homes last year and 450,000 houses in total. 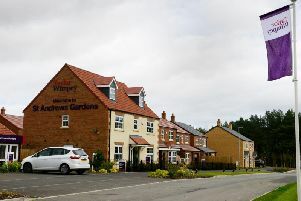 Mr Martin said: “May has been a special month for Barratt Developments and it’s been fantastic to celebrate the heritage and history with the local communities we have built in, particularly with the tree planting at South Fields. South Fields is a development of three, four and five-bedroom houses, available from £179,995, and two-bedroom bungalows from £199,995.